To really see all the Rembrandts in one place would be impossible (his recognized legacy consists of about 300 paintings, the same amount of etchings as well as hundreds of drawings) but there is one place that has more of the master’s works than anyone. Predictably, this place is in Amsterdam, the city where he spent most of his life. The Rijksmuseum holds the world’s largest collection of his works and the 350th anniversary of his birth is being celebrated there in an “All the Rembrandts” exhibition that showcases its entire collection of 22 paintings, as well as 60 drawings and 300 finest prints selected from the museum’s huge depository. It’s a breathtaking show of a lifetime that brings together various themes in the master’s lifetime of creating. The show starts with two portraits that book-end both Rembrandt’s actual life as well as his artistic path. The first picture is his self-portrait painted when he was barely 22, after a short apprenticeship with an established history painter Pieter Lastman, but you can see that he had already an absolutely original artistic voice. The second book-end display is a self-portrait as an Apostle Paul – painted when Rembrandt was old, broke, alone and at mercy of increasingly rare patrons. His entire life’s successes, his tragic decline and a lifetime of making self-portraits took place between these two images. No other artist has documented his changing image in various artistic guises as Rembrandt who created his autobiography in almost a hundred self-portraits and group compositions. In the first painting, his youthful artistic cockiness is evident in how he chooses to hood his eyes by placing the source of light behind him. It forces us, the viewers, to lean closer, to study his face and to seek an expression of his shaded eyes. It also presages his lifetime “trick” of making the viewer a participant in the story that the painting is telling. A perfect example of such picture is also very much on display in this exhibition. The Syndics, a famous group portrait that he painted towards the end of his life, is a commissioned portrait of trade guild managers. Rather than compose an orderly row of men staring stiffly into the space, Rembrandt chooses to present a snapshot of people on motion. They all look back at the viewer, caught in mid-gestures while one of them is half bent, in the middle of rising or sitting down. They all interrupt their activities to look at the person entering the room – the viewer of this painting. The exhibition’s oil canvases are surrounded by the original 17th c. prints of etchings, as well as sketches and drawings that are so fragile that they rarely go on display. Rembrandt spent a lifetime drawing his own face in a myriad of expressions. He also recorded intimate portraits of women in his family, faces of people he met in the street, poses and gestures of people surrounding him, little street tableaux of mothers tending to their children, craftsmen and laborers at work, beggars and drunkards with lined and contorted faces, even a lion brought to port by an East India Company ship. 1642, the year of the greatest artistic triumph of The Night Watch, was also the year when Saskia died. 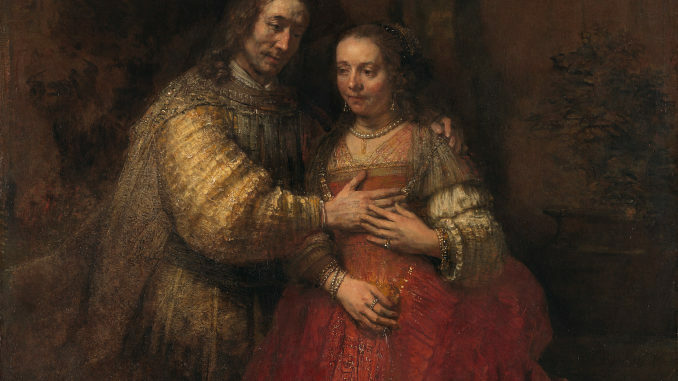 Once Rembrandt lost his beloved wife, his personal life went into decline. He got entangled in an ugly relationship with a servant, his large painting commissions started to dry up, his inability handle finances caught up with him when his grand house and his large collections of art and curiosa were auctioned off. As it often happens, art seemed to be his only respite. He threw himself into making etchings and sketches. Making of art prints in 17th century Netherlands was not just a casual artistic pursuit. Like textiles or cabinetmaking, the production (and sale) of images was an industry – organized by guilds, production process streamlined and regulated, distribution channels established. Rembrandt could have been making tons of money just running a successful print shop and mass producing quick religious images for sale. He was not. He also did not make pastoral scenes with fake shepherdesses, no fake genre paintings of imagined merry peasants, no popular decorative pictures of bouquets or comic tavern scenes. Instead he made two dozens of beautiful landscape etchings and some of his most ambitious and masterful prints: a portrait of Dr. Ephraim Bueno, the so called Hundred Guilder Print of Christ preaching and The Three Crosses – all of which are lovingly displayed at the exhibition within context of similar themes and period. If there is one thing that so many artists have in common across centuries is their inability to make compromises. There is a perfect example in Rembrandt’s biography when he was in his last, saddest stage of life. He bungled his last big commission. The City of Amsterdam wanted a large, decorative piece like Night Watch for the newly built city hall. What they got in The Conspiracy of the Batavians under Claudius Civilis (currently in the National Museum in Stockholm) was a gory picture of an old man, blind in one eye, painted in a “messy,” free-handed style of Rembrandt’s “rough” manner of his late period. The painting was taken down and Rembrandt was unable to re-sell it, not even after cutting it into smaller pieces. Imagine how desperate for money an artist has to be to butcher his own work. Rembrandt died in poverty, buried in a pauper’s grave like Mozart. There is no grave to put flowers on. These days, you can honor him by admiring his oh-so enduring art in a museum. No better place to do so than visiting “All the Rembrandts” at the Rijksmueum. Later this year, the museum is presenting side by side the two giants of the 17th century European art in Rembrandt-Velázquez.